Towns and cities across the country have been holding events this week recognizing America’s wind power leadership, and the conversation has boomed on social media. But governors and mayors from coast to coast have weighed in too. Read more here. “North Dakota is an example of what can happen when you harness a true all-of-the-above energy strategy, which includes renewable energies like wind that supports thousands of good jobs across our state while powering homes and businesses here and in states across the region,” said U.S. Senator Heidi Heitkamp. “I’m proud to have worked to successfully extend the wind energy tax credit back in 2015 to support wind energy development and jobs across our state, and it’s an honor to receive this award today. 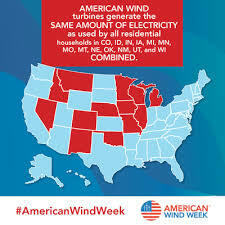 Wind energy is one of many resources I’ll continue to advocate for. But the ones really who deserve to be acknowledged are those who go to work manufacturing the turbines, constructing the wind farms, and maintaining the wind energy supply and of course the farmers and ranchers who host these turbines on their land. This entry was posted in NewsBlog and tagged American Wind Energy Association (AWEA), American Wind Week, Into the Wind - AWEA Blog, Senator Heidi Heitkamp, U.S. Wind Champion for the 115th Congress on August 9, 2018 by Helen Deffenbacher.